SC3000 The staple assault rifle on the Splinter Cells, the SC3000 offers strong, accurate gunfire with minimal recoil. SMG-2 The SMG-2 offers great power in the form of a highly accurate, powerful one-handed machine pistol. MP5 A silenced sub-machine gun, the MP-5 is an ideal choice for high accuracy, moderate damage and silence. Includes 24 track Soundtrack ! NEW LEVEL OF ACTION FOR SPLINTER CELL - A full arsenal of cutting-edge innovations allows you to outflank foes with the Last Known Position™ system, tag and eliminate enemies using the Mark and Execute™ feature, and much more. BLOCKBUSTER EXPERIENCE - A unique storytelling style keeps you on the edge of your seat as you navigate the explosive world of a renegade agent where trust is impossible and justice requires you to go above the law. 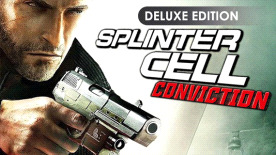 JAW DROPPING VISUALS - A revolutionary new graphic direction delivers an utterly seamless gameplay experience that’ll keep you totally engrossed in the story of Sam Fisher. EXPLOSIVE ONLINE PLAY - Brand-new addictive multiplayer modes amp up the dramatic intensity like never before. *© 2002–2010 Ubisoft Entertainment. All Rights Reserved. Splinter Cell, Splinter Cell Conviction, Splinter Cell Double Agent, Splinter Cell Chaos Theory, Sam Fisher, the Soldier Icon, Ubisoft, Ubi.com, and the Ubisoft logo are trademarks of Ubisoft Entertainment in the U.S. and/or other countries.